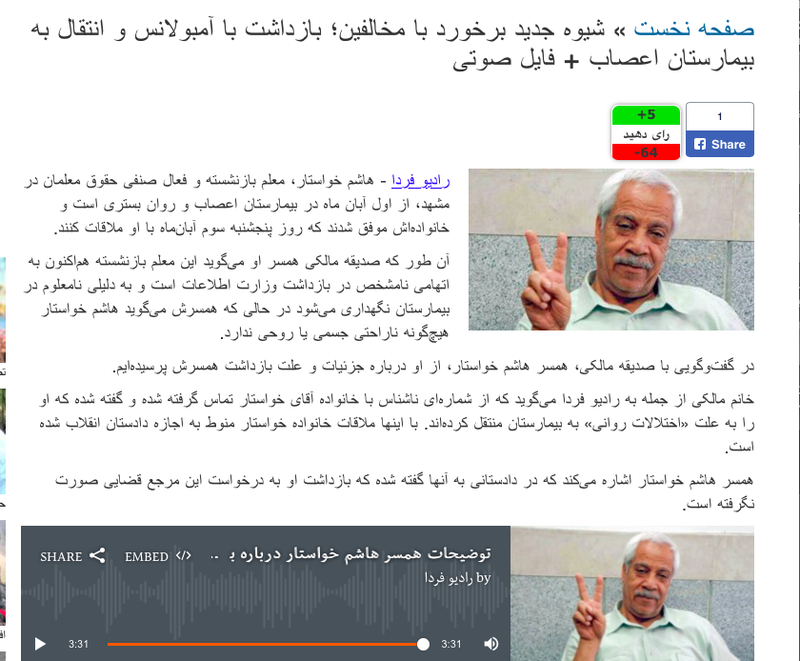 Hashem Khastar A retired teacher and a rights defender of teacher and a teachers Union Activist in the city of Mashhad was arrested and was transferred to a mental hospital according to his wife Sedigheh Maleki who was able to visit him. Mrs. Maleki said ; this retired teacher is currently in prison by the Ministry Of Information without any known accusation and he is in mental hospital without any physical or mental problem. Mr. Khastar's family said; an unknown number called them and told , Mr. Khastar is hospitalized because of his mental problem. While speaking with Radio Farda , the wife said: On Tuesday morning ( 8 days ago ) Mr. Khastar left home and since then we had no news about him and his mobile phone was shut down and after a while his car was found outside the city ( Mashhad ) beside a garden .....My husband was arrested by Sepah Intelligence and he was transferred to Ebn-Sina Hospital which is a mental hospital . With The kidnapping , Expelling Teachers From School And Summons , The Voices Of Teachers Wont Be Silenced ! 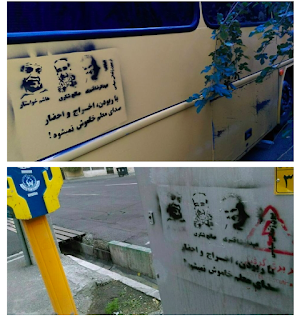 (Beirut, October 26, 2018) – Iranian authorities have issued indictments against eight detained environmental activists that could lead to the death penalty, Human Rights Watch said today. Iranian authorities should immediately release these activists who have been arbitrary detained for nine months unless they can produce evidence to justify the charges against them and guarantee a fair trial. When the law is applied in such a vague way that people cannot predict which acts are crimes and detainees suffer major violations of due process rights, prosecutions are arbitrary, Human Rights Watch said. 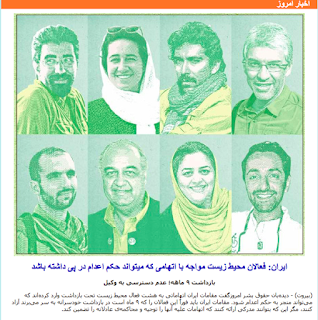 On January 24 and 25, the Revolutionary Guards’ intelligence organization arrested Houman Jokar, Sepideh Kashani, Niloufar Bayani, Amirhossein Khaleghi, Sam Rajabi, Taher Ghadirian, Kavous Seyed Emami, and Morad Tahbaz, all members of a local environmental group, the Persian Wildlife Heritage Foundation. On February 25, authorities arrested another environmentalist, Abdoreza Kouhpayeh, who remains in detention alone with seven other activists. During nine months of pretrial detention, none of the detainees have had access to a lawyer of their choice and authorities have not set a trial date. On September 30, family members said on social media that judicial authorities had told them that the environmentalists can only be represented by lawyers from a pre-approved list of 20 that the judiciary had published in June. 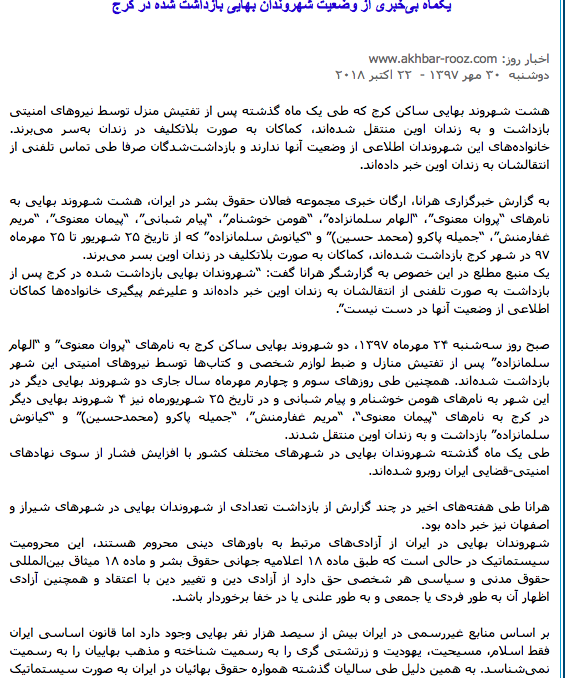 The authorities have not allowed Mohammad Hossein Aghasi, a lawyer chosen by Rajabi and by Ghaderian’s family to represent them, to see his clients, Aghasi told Center for Human Rights in Iran. 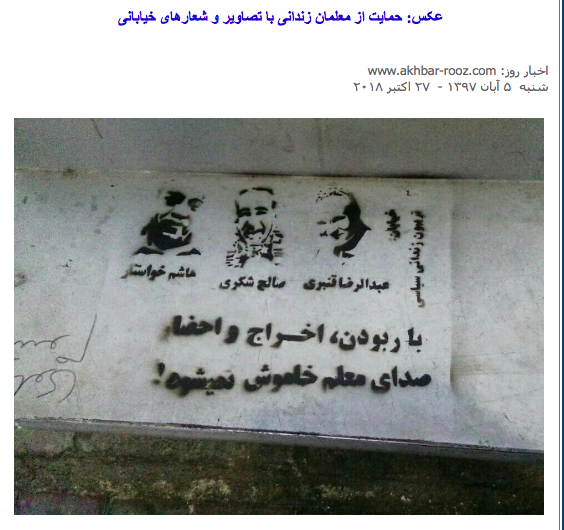 On October 22, Aghasi had told the Iran Wire news website that five of the detained activists faced the “corruption on earth” charge. On February 10, family of Kavous Seyed Emami, an Iranian-Canadian university professor who was arrested with other activists, reported that he had died in detention in unknown circumstances. Iranian authorities claimed that he committed suicide, but they have not conducted an impartial investigation into his death and have placed a travel ban on his wife, Maryam Mombeini. Two sources who have close knowledge of the Persian Wildlife Heritage Foundation and preferred to remain anonymous told Human Rights Watch that all of the foundation’s projects, including their wildlife monitoring projects, were carried out with required permission from relevant authorities. Several senior Iranian government officials have said that they did not find any evidence to suggest that the detained activists are spies. 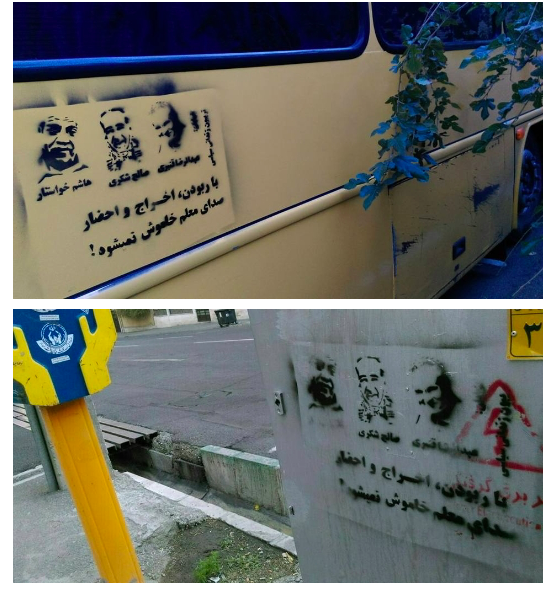 On May 22, Iranian Student News Agency (ISNA) reported that Issa Kalantari, the head of Iran’s Environmental Institution, said during a speech at a biodiversity conference that the government had formed a committee consisting of the ministers of intelligence, interior, and justice and the president’s legal deputy, and that they had concluded there was no evidence to suggest those detained are spies. On October 22, when asked about the charges, Kalantari told ISNA that the committee could no longer intervene in the case and the Intelligence Ministry had announced its decision about these activists. 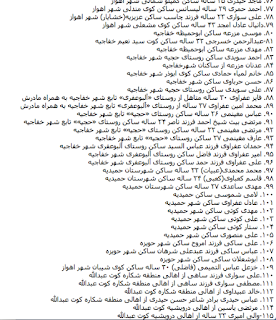 Article 48 of Iran’s 2014 criminal procedure law says that detainees charged with various offenses, including national or international security crimes, political, and media crimes, must select their counsel from a pre-approved pool selected by Iran’s judiciary during the investigation. The list of lawyers published in June did not include any women or human rights lawyers. 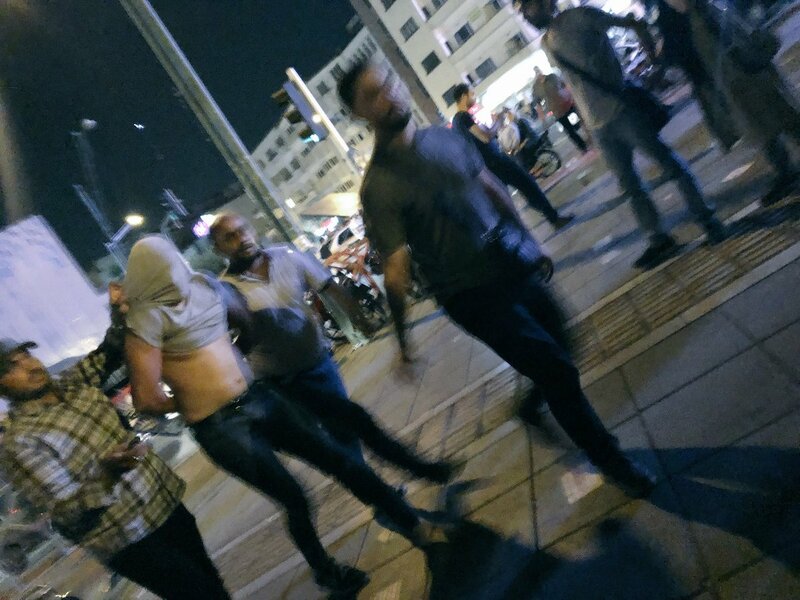 Under the International Covenant on Civil and Political Rights (ICCPR), to which Iran is a state party, the authorities are required to ensure that anyone facing criminal charges has access to a lawyer of their choosing. Anyone arrested should be promptly informed of any charges against them, and detention before trial should be an exception, not the rule. Anyone detained is entitled to a trial within a reasonable time or release. Under article 286 of Iran’s penal code, “Any person, who extensively commits a serious crime against people’s physical safety, offenses against internal or international security of the state, spreading lies, disruption of the economic system of the state, arson and destruction of properties” can be considered among the “corrupt on earth” and sentenced to death if the court finds “the intention to cause extensive disruption in the public order, or creating insecurity, or causing vast damage or spreading corruption and prostitution in a large scale, or the knowledge of effectiveness of the acts committed.” Otherwise, the sentence can be between six months and five years. According to a report , Saeed Malekpour the Iranian -Canadian who has been in Islamic regime jail for 10 years now, was transferred to hospital from prison due to a heart attack and was removed from hospital again by security forces back to prison . 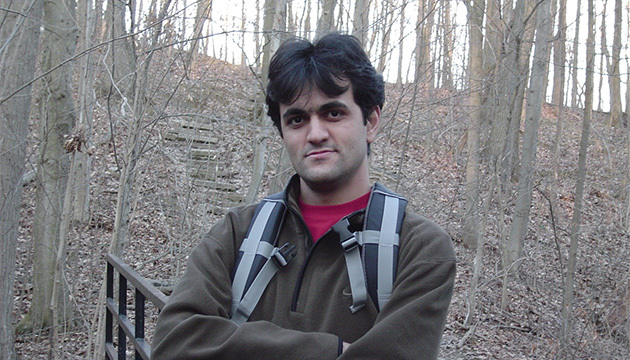 IRAN WATCH CANADA: Saeed Malekpour needs medical attention and the Islamic regime judiciary and prison officials denies these needs to him and to many prisoners . 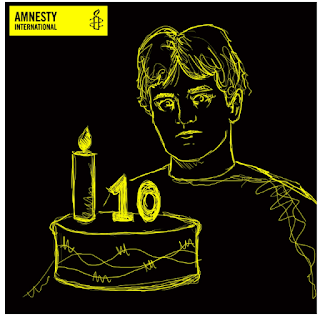 These inhuman practices must be stopped and innocent political prisoners Like Saeed Malekpour who have been accused of designing web must be released immediately . Saeed Malekpour is an Iranian web designer. He was sentenced to death in Iran for allegedly designing and moderating pornographic websites. Malekpour developed an Internet photo-sharing tool that his supporters assert was used without his knowledge for pornographic . 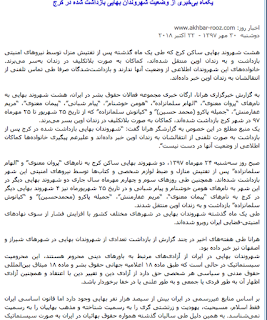 According to news , eight Iranian Bahai citizen were arrested at their homes in the city of Karaj by Islamic regime security forces and were transferred to Evin prison , but still there is no news about them and their families don’t know how is their loved ones situation. 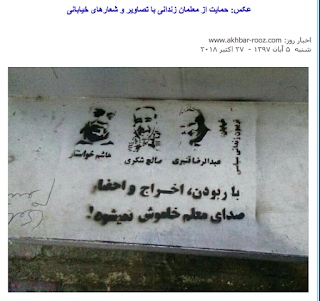 Those arrested were only able to make a call and to say they are in Evin prison. 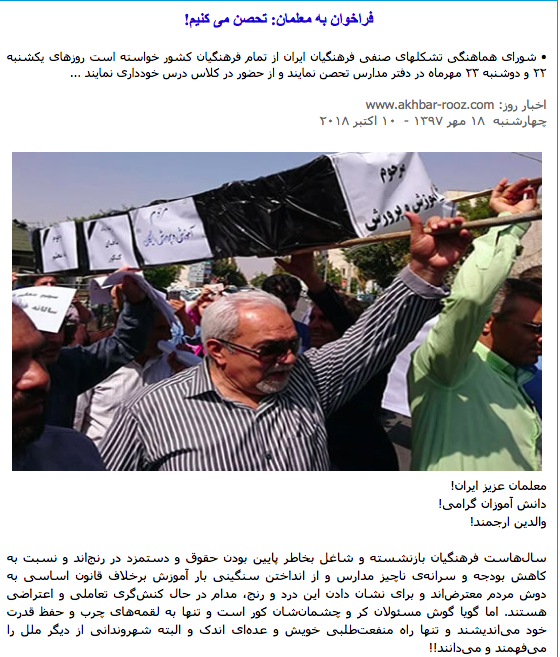 According to HARANA news, During last month Bahai citizen from different cities undergone increased pressure by security and judicial agents of the regime. HRANA also reported on Bahai arrested in the city of Isfahan and Shiraz …. 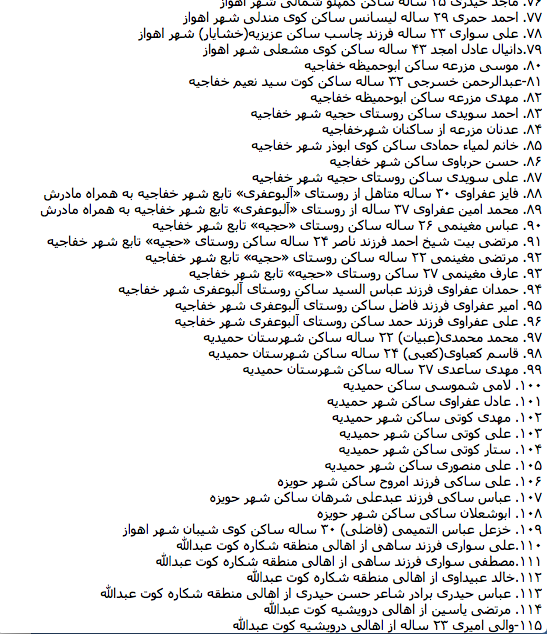 There are more than 300,000 Iranian Bahai living inside Iran . 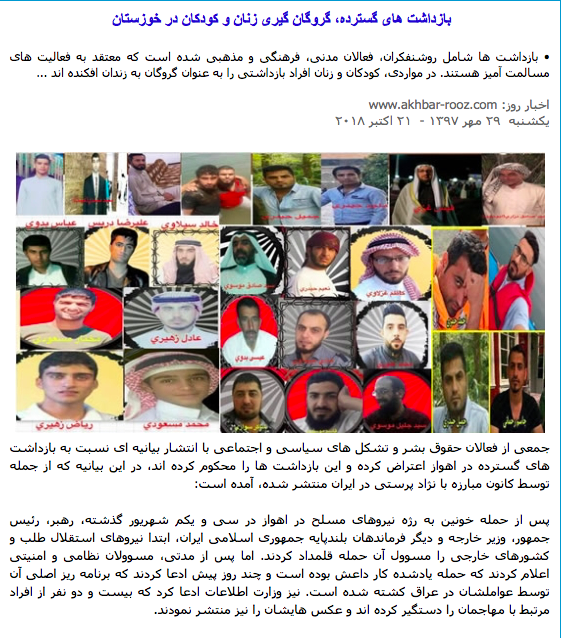 After the recent attacks on a military parade in the city of Ahwaz , regime security forces have arrested many peaceful activists including human rights , cultural , religious , writers and political dissidents, reported a group of socio-political and human rights activists . A statement released by a group of socio-political, human rights and anti - racism group condemned the arrests of many ( More than 100 people including children ) after the recent attack on a regime's military parade . 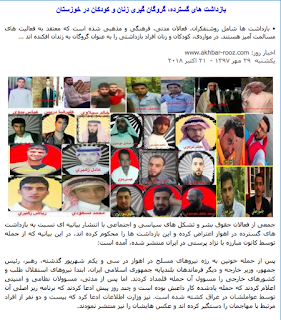 The statement released the name of more than 115 people arrested and detained by regime from the city of Ahwaz and its districts . In the absence of independent media and reporters , the fear for more arrests is possible and there are no news about these peoples . The 2nd day of strike by teachers in Iran continued .....In some cities students also supported their teachers . 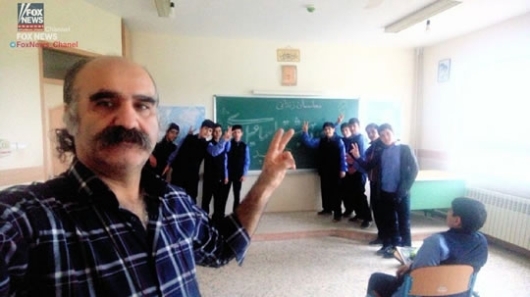 News indicate that , Mohammad Reza Ramzanzadeh an active teacher is arrested. The Coordinating Teachers Council in Iran ( The teachers Union ) asked all teachers from all over Iran to join the strike at their schools by not attending the classes (boycotting the classes ) on this coming Sunday and Monday . 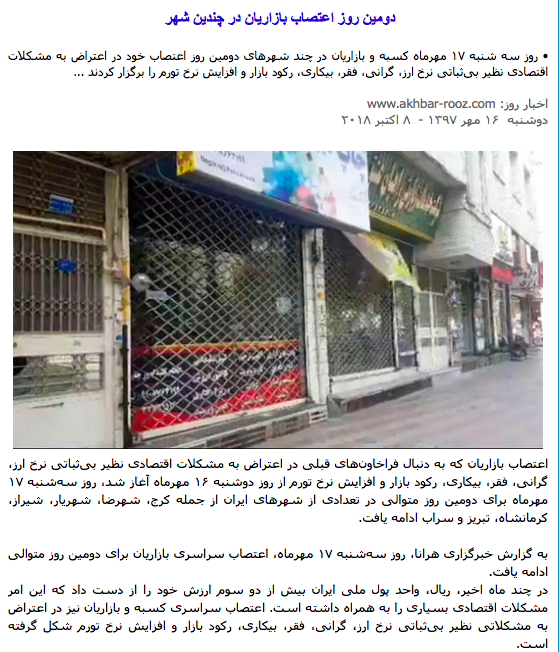 Its the 2nd days that the business owners in Iran shut their business due to devaluation of the Iranian currency and high cost of commodities / products. Recently Iranian money dropped its values due to the coming Sanction by US in November . This has effected all big and small business owners all over Iran. Our worries now is about Arash ( Sadeghi ) , because his health condition at the beginning wasn’t that bad , but because of not paying attention to it , it became worse and this needs to be treated outside of prison….. that he need to have doctor and also need to take medical tests …. 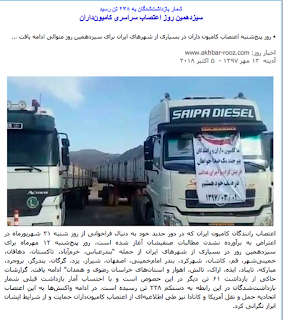 Truck drivers in all over Iran started their 2nd round of strike against the cost of truck parts and cost of living as well as government policy and ignorance towards their demands . Its been 13 days since they have started their strike by shutting down their trucks and not attending at their work. Instead of solving the problems of the truck drivers ,based on reports by official news , regime forces have arrested as many as 238 drivers from all over Iran . 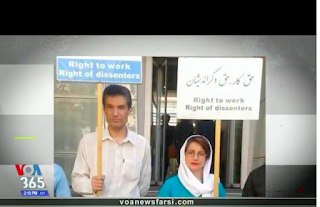 Nasrin Sotoudeh is the Iranian lawyer and human rights advocate . As a lawyer she has also defended the " Daughters of Revolution Square " ( Women removing their hijab in opposition with compulsory Hijab policy by Islamic regime in Iran ) and she also defended juvenile offenders in the court to stop their execution. 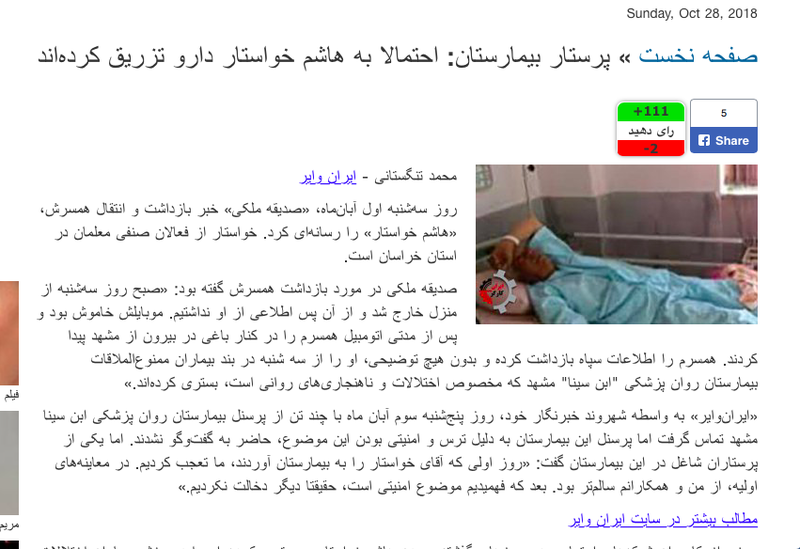 She has ended her hunger strike after 38 days only when more than 300 Iranian personalities requested her to end her hunger strike via a petition . Nasrin Sotoudeh is a mother of two beautiful child and her husband is also currently in prison. In recent weeks while in prison , Nasrin Sotoudeh refused to wear hijab when her daughter came to visit her and because of that , she was banned from any visitation rights . Doctor Farad Meysami a human rights defender and a colleague of her is currently on hunger strike for 62 days ......Doctor Meysami's health situation has dramatically deteriorated and need immediate attention.